A slew of measures new and old were revealed this weekend, ahead of the expected December tax announcement. Despite sluggish economic indicators such as a declining GDP and shrinking inflation following last April’s consumption tax increase, the government of Japan is doubling down on some of the key Abenomics policies that saw the country’s economy bounce back at the beginning of Prime Minister Shinzo Abe’s administration. Since this weekend the government has announced a more aggressive investment policy at the Government Pension Investment Fund (GPIF), a new stimulus package, and additional monetary easing. The first of these moves had long been planned, while the second was expected, but the third caught markets off guard. However, all are designed to restart a sluggish economic recovery and give Abe the ability to follow through with the second consumption tax hike, expected in October of next year. The shift in direction at the conservative GPIF has been expected for most of Abe’s administration, even if the exact changes to its portfolio weren’t clear. 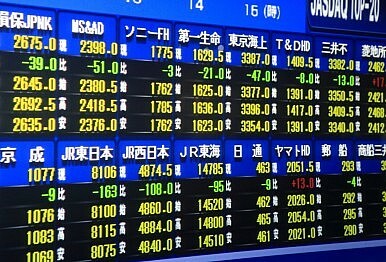 However, “informed sources” that spoke with the Jiji Press stated that the GPIF will raise its percentage of Japanese stocks from 12 percent to 25 percent, while domestic bonds will be reduced from 60 percent to 35 percent of its portfolio. Additionally, foreign stocks and bonds will be raised from 12 to 25 percent and 11 to 15 percent respectively. The GPIF currently manages about assets of about 127 trillion yen ($1.18 trillion), and the diversification is seen as a way to better manage the large pension fund’s investments as the country is expected to transition out of deflation. What makes Kuroda’s decision unexpected is that he has been saying over the past few months that he was pleased with the current rate of growth, despite the fact that inflation had cooled from 1.5 percent in April to just 1 percent before the BOJ’s announcement. Additionally, unlike the previous round of monetary easing that passed the Policy Board by a 9-0 vote, last Friday’s vote barely passed 5-4. The government appears to be firing on all cylinders to keep its fragile economic recovery on track. Weak third quarter growth after the economy contracted 7.1 percent in the second quarter would begin to put significant political pressure on the Abe administration. As a consequence, the prime minister and other government institutions look to be trying to get out in front of the issue with measures intended to reassure markets, voters and consumers. It also appears that the LDP-led government remains focused on keeping the next tax increase in place, as it is conducting hearings on the issue from Tuesday until November 18, after which Abe will “give instructions to compile the economic measures [stimulus].” If the government plans to stick to its original schedule of announcing the tax increase in December, then the next few weeks will be crucial for improving the ability of both public opinion and the economy to absorb it. It's Official: Japan's Population Is Still DecliningIs Japan's LDP Beginning to Get Serious About Reigning In Public Debt?Can Shinzo Abe Inspire Silicon Valley's Dynamism in Japan?Shinzo Abe’s Election GambleCan Japan’s Corporations Kick-Start Recovery?